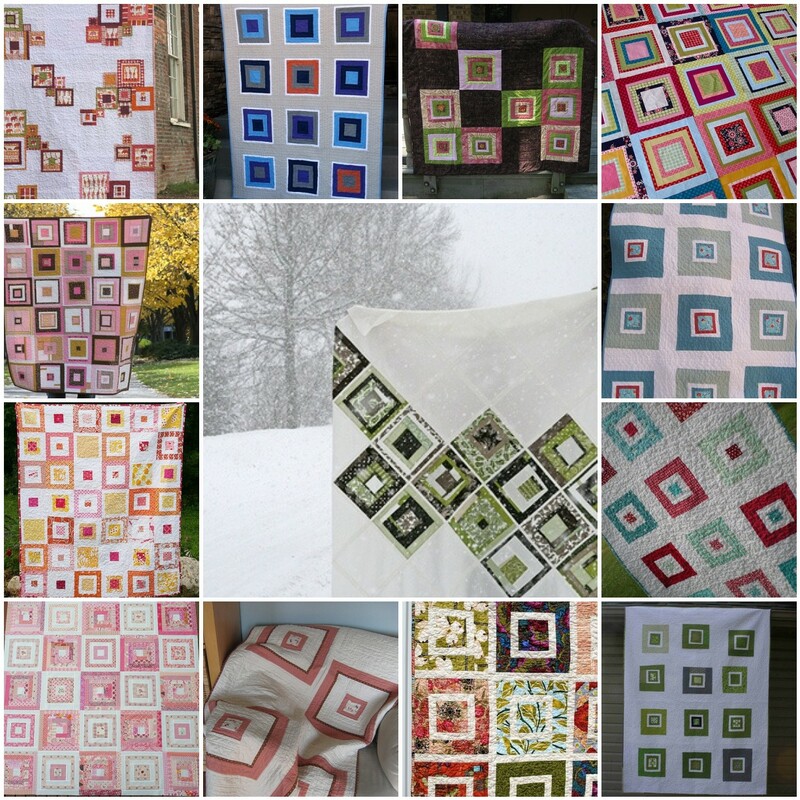 One of my (many, many) ideas I considered for my month of my bee was to make square in square blocks, destined for some sort of floating non-grid layout like Ashley’s (Film in the Fridge) Greenfield Hill Quilt I ended up going in a different direction for the bee – but here are some of the quilts I looked to for inspiration. 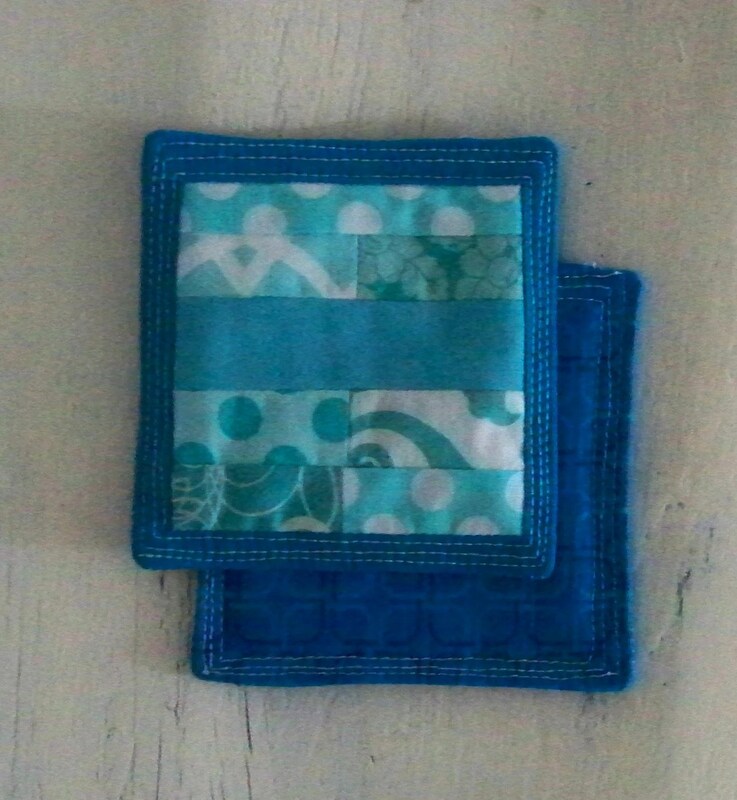 These new potholders have been gracing my kitchen for the last week or so. I won’t show you the potholders these replaced: suffice it to say they were commercial potholders that were merely good-enough when they were new, and they were far from new. 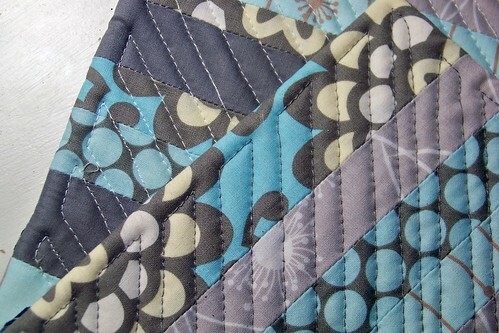 I first pulled this stack of fabric back in early December when I was playing around without a clear goal. 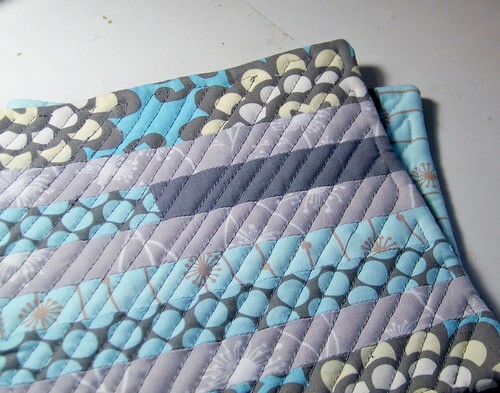 But, coincidentally, the blue is a perfect match for my kitchen, so I started cutting and sewing strips, and quilting lots of diagonal lines. The combination kind of looks like a cold rain to me, but I like it anyways. I gave a sneak peak a couple of weeks ago, when this project was all but finished, then wandered off and forgot to show you all the final results. Sorry! Lots of straightline quilting: In addition to intheditch rows, and more just outside the ditch along the body of the scarves, I used it to emphasize the fringe and to add extra stripes. I think the table runner was a trial run; as I was sewing, I’ve been thinking of a version as a tree-skirt (or maybe just a small quilt), with snowball blocks, and green and white and ash. It’s not how it’s supposed to work, but I liked the scrappy project so much that I finished it before the original project. 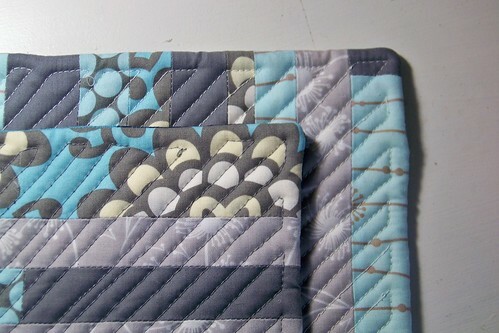 These little aqua rectangles are the ends of some strip piecing that were too short for the squares I needed. 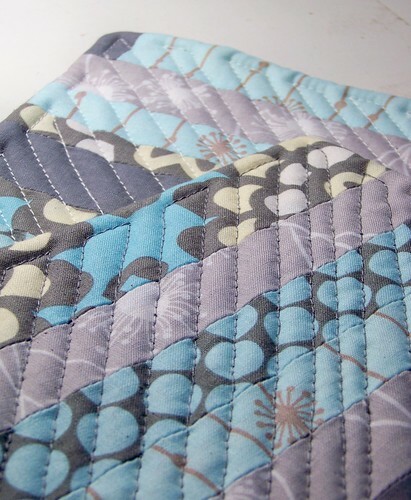 A few extra strips, some borders, some quilting – and a set of coasters I really like.